Lowly Lichen....Anyone Still Use It? Finding this bag of lichen gave me an idea as to how to finish a steep grade behind a large building. I'll use lichen and some tall plant material like Scenic Express trees planted in the lichen. Lichen maybe easier to install in mass than ground foam or make rock formations. Old, dried out lichen mixed with ground foam makes good small broken branches and ground litter and I have a half full bag of the dried out lichen just for this purpose. Anyone else use lichen and do you make use of it? I've used it on areas where it can't be recognized as lichen. I also used it as underlying support for hillside vegetation, with Scenic Express leaf material sprinkled on top - can you spot which of the bushes are lichen-based? My wife got me a couple of bags for Christmas a couple years go. Still usin' 'em! I have a bag of it on hand. It may not be all that popular BUT it has some great uses, especially for fill and adding dimension to an area. I still use it sparingly, to add different textures to background scenery. I no longer use lichen, but not for any other reason than that I no longer live in the mountains. I can't walk out my back door and "harvest" it off the trees anymore. I have lichen growing all over my Central Wisconsin wooded acres. Never considered "harvesting" it since its easier just to buy a bag or two from Woodland Scenics. Lazy way of using things. yep, still use it ..
mix with ground foam and sand mostly .. I haven't used it since I tore out my N scale layout in the late 70's. 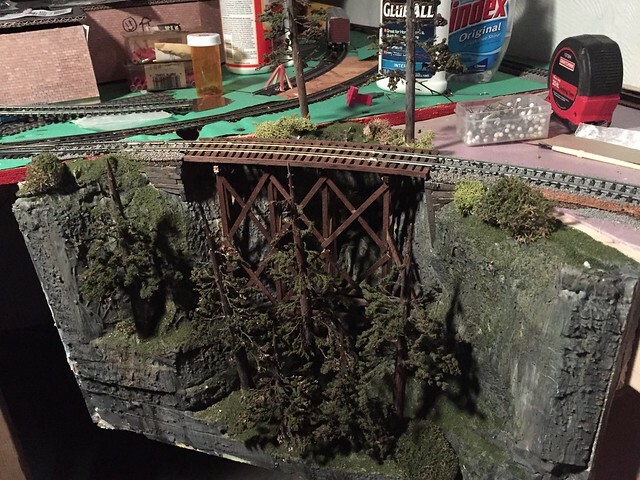 By the time I started scenery on my HO layout, ground foam and other scenery products were available. I know I have a bag full of it. Judging by some of the pics I've seen in this thread I know how I'm going to cover my hills on my layout.